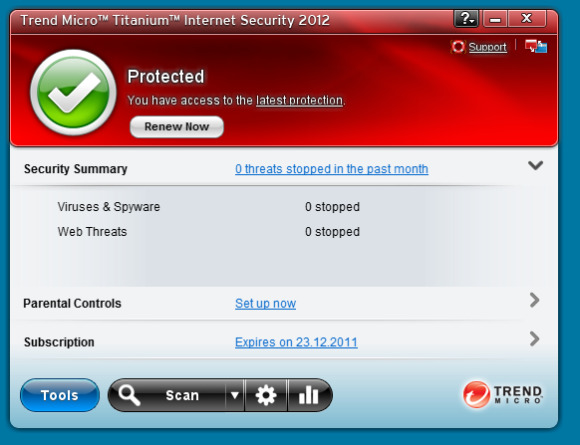 If you’re looking for a suite with a ton of features, Trend Micro Titanium Internet Security 2012 ($70 for one year and three PCs as of January 25, 2012), which finished fifth in our 2012 roundup of security suites, isn’t for you. But if you need a set-and-forget suite that will keep your PC reasonably safe, it may be the right choice. Trend Micro's suite fully blocked 92.3 percent of malware in our real-world test (which helps determine how well a suite can stop brand-new as-yet unknown malware), and it partially blocked an additional 3.8 percent, landing around the mean for the products we tested. In addition, it detected 97.49 percent of known malware samples. Although that is a decent result historically, Trend Micro lags behind rivals in this regard (most other suites we looked at detected over 99 percent of samples). As for false positives, it identified four safe files out of a pool of 250,000 as potentially malicious. Percentage-wise, that's a negligible false-positive rate, though most other suites managed an even lower number. Trend Micro’s suite is very effective at cleanup, as it detected and disabled all active infections on our test PC, and removed any and all malware traces for 70 percent of our test samples--a better-than-average result. Unfortunately, its scan speeds were uneven. It finished our on-demand scan of 4.5GB of files in a better-than-average 1 minute, 33 seconds, so when you manually start a scan, you shouldn't have to wait too long for it to finish. On the other hand, it took longer to complete an on-access scan of 4.5GB (5 minutes, 14 seconds) than most other packages did. Trend Micro's poor showing in the on-access scan--which shows how quickly a suite scans files when you open or save them--may be a concern, since it means that you'll probably have to wait longer for files to open. Despite its somewhat middling detection scores, Trend Micro's security suite is simple to use.